As part of our research in Personal Robots Group we explore how children interact and learn with personal assistants, robots and smart toys that are becoming more and more common in their homes. We discovered that they would get frustrated when Alexa didn't know how to answer their questions and we decided to build a skill that would allow them to personalize and customize the interaction with Alexa and make it a real personal chat bot. We have a NodeJS backend which hosts our REST APIs. We are using Express Framework to write these APIs easily. To store data, we are using MongoDB, a NoSQL database. 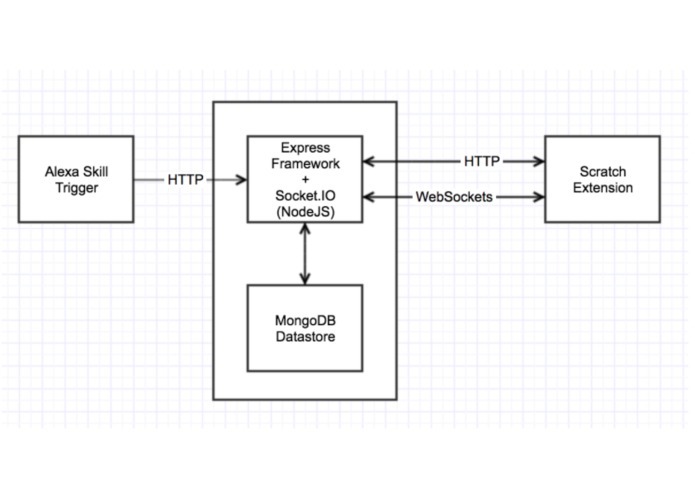 We access mongoDB from NodeJS server using mongoose module. We also have a WebSocket server running on the same NodeJS server. We use socket.io module for this purpose. Our websocket server is used to communicate with our Scratch client. When a user logs in through Scratch, the user is given a 5-digit access code. The user can use this access code to login through Alexa using his/her voice. The scratch client connects to the websocket server and sends a registration request containing the access code. The Websocket server identifies the user using the access code and saves the current socket ID of the user. When the user asks the answer to a question about himself/herself, alexa skill makes a request to the express server with the authentication token of the user that the skill has received after logging in using the access code. This authentication is unique to every user and is used for further requests to save or get details regarding the user. When the user asks alexa skill to run a block set on the Scratch extension, the request is sent to the express REST API with the users authentication token. The NodeJS server identifies the user using this authentication token, gets the current socket ID of the user, and sends the run block set command to the Scratch client using the active socket connection. 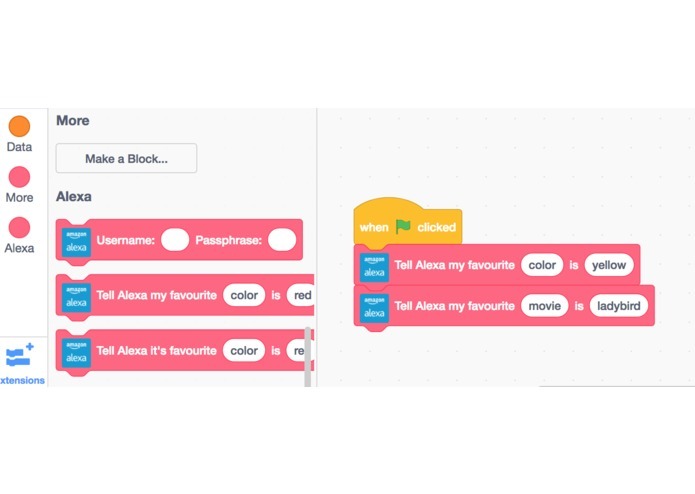 Credits: we built the Alexa Extension for Scratch 3.0 by using the open source code for Scratch Blocks, Scratch VM and Scratch GUI provided by Lifelong Kindergarten Research Group at MIT Media Lab and by referencing their documentation for Scratch Extensions.